It has been long speculated that Google is going to monetize YouTube using one way or the other apart from just using the advertising on the videos. One of the speculated models for monetization was the monthly subscription model of YouTube channels. Stating today, Google is launching monthly subscription model with a small set of YouTube Partners offering paid channels on YouTube with subscription fees starting at $0.99 per month each of which comes with 14-day free trial. If the users want to pay an annual subscription fee, many channels offer discounted yearly rates. At the moment we can see 53 paid pilot channels available here. They are still shown unavailable here in India. 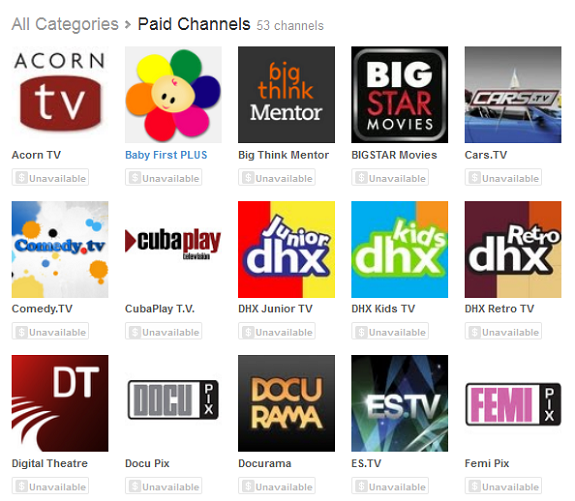 Some of the pilot channels available include pilot channels include UFC, NGKids, HDNet and PGA_com Golf Academy. Once any user buys a subscription for any paid channel, he will be able to watch those paid channels on his computer, phone, tablet and TV. More devices are slated to be added later on. As this is an initial roll-out, the number of channels will start increasing soon and number & variety of paid channels will increase as the time passes by. If you love watching YouTube channels even when most of them are ad supported, you aregoing to perhaps hate this move. The reason being sooner or later, most of the popular YouTube channels that you already enjoy will soon have paid channels instead of just the Ad supported one. We are still not sure of the impact of this paid channels subscription model and we would have to wait & watch to see how good or bad it turns out to be. Share your thoughts if you watch YouTube videos.